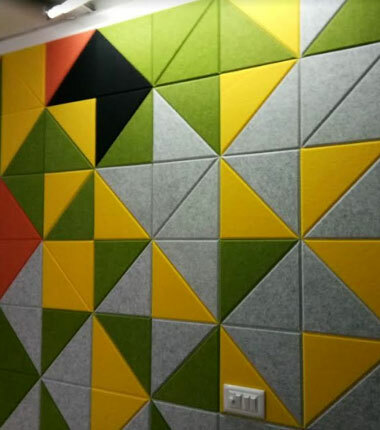 Envirotech is a leading Manufacturer of Decorative Polyester board / Echo Boards. 1. We are selling 200kgs/m3 + Density, others are selling 150kgs Density. 2. The Lusture, brightness, Color sharpness we have, is not there in any other supplier. 3. Our Boards are very stiff as compared to any other. » Noise absorption coefficient: NRC=0.85. It has high sound absorption and noise reduction characteristics. » Formaldehyde emission: It is a green material with asbestos-free, non-toxic and tasteless gas under extreme temperature, protecting the ozone layer, non-irritant and recyclable. » Good insulation properties, to prevent transmitting the heat from outdoor to indoor directly as partition or and ceiling, saving 35% of energy, extending the life of air conditioning. » Light weight and free cutting, a variety of colors with simple corner treatment, different shape and any pattern styles can easily reflected. » Simple maintenance, easy dust removal by vacuum cleaner or feather duster, spot can be cleaned by wet towel or cleaner.